Wrap-around bumper bar incorporated indicator lenses and number plate mounting in the centre. Front under-valance with air intake slatted grille, below which was a full-width black rubberised spoiler, on later models incorporated into all-enveloping bumper bar. 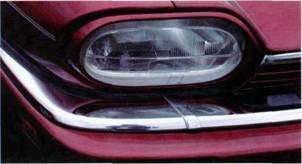 Single oval headlights with surrounds featured, for UK and European cars, a conventional four headlight treatment, with chrome surround for US and Canadian models. Shallow radiator grille with horizontal slats, full width between headlights and central badge. One-piece forward-hinged bonnet, with front centrally mounted circular 'gunmetal' growler badge, swept down at front to meet radiator grille. Bonnet shaped to meet wings and headlight pods. AJ6 cars featured raised centre bonnet section to clear engine height, later adopted for all cars. Rear of bonnet bulkhead-mounted air intake in various finishes according to model and year. One-piece curved windscreen with chromed surround and twin wiper blades. …revised side elevation. Note the rear side window changes and boot styling. Rear heated screen with chromed surround following contours of roof and buttresses (coupe models). Flat boot panel with black-painted vertical section on early models only. On boot vertical panel appropriate badging according to model and year. Centre boot panel plinth contained twin reversing lights, hidden boot lock, and the name 'Jaguar' in bold lettering on a finisher surrounding boot key lock, later changed completely with facelift models. Rear light units wrap around wings at base and sculptured to wing curvature at the top. Facelift models featured neutral density integrated light units. Wrap-around bumper to match front, although in this case running for the entire length of rear wings to meet the rear wheel-arches. 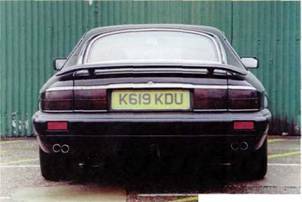 Twin exhaust tailpipes emerged from rear valance as on XJ saloons. The deeper rear window of the earlier two-seater convertibles easily identities these cars from the outside. More changes from 1993, with all-enveloping plastic bumper bars painted to body colour. This is the later 2+2 convertible model, which necessitated a shallower rear window. Coupes of all ages are instantly identifiable by the flying buttress flowing down from roof panel to rear wings, on the nearside featuring concealed fuel filler cap. Slab-sided with waistline body crease. Later models featured swage coachlines according to model and year. Ford Cortina chromed flush door handles and black powder coated door and window surrounds with non-opening front guarter-lights. Facelift models abandoned door window frames, revised rear window treatment, and had new door handle design. Driver's door only mounted mirror on early cars. Later design changed and fitted mirrors both sides. Alloy wheels fitted to all cars of differing types according to model and year. Different styles of coachline were used on XJ-S models. Pre HE models had no coachline. HE and 3.6-litre cars featured this style of double line. Twin thin opposing colour lines used on cars from 1988 on. After facelift a single colour line was adopted. Black rubber bumper bars front and rear with no chrome finishers. Headlights and radiator grille with chromed surround. Centrally mounted radiator grille depicted 'V12' emblem. 'XJ-S' only badging featured on boot panel. Matt black vertical boot panel only featured on very early cars. GKN Kent alloy wheels fitted. New style rubber bumper bars front and rear incorporating chromed top finishers similar to those used on Series 3 XJ saloons. Different more prominent bumper bars featured on some US models. Growler badge in pewter style now fitted to forward centre area of bonnet. Side indicator repeater lenses on forward edge of front wings (larger type fitted to US and Canadian models). Five-spoke silver/grey Starfish alloy wheels fitted. Double-stripe swage coachline along entire length of body. Larger chrome-plated door mirrors now fitted to both doors. 'XJ-S' badge now moved to left-hand side from right and 'HE' badging fitted to other side of boot lid panel (later changed to 'V12'. Growler badge in centre of radiator grille. New bonnet with raised centre section. Silver finish pepperpot alloy wheels, but Starfish were available as an option. '3.6' badging on right-hand side of boot lid. Side view above door height revised with 'solid' frame, black powder coated with more pronounced B/C post with chromed leaper badge at base. Door and window surround as part of main body structure with chromed rain gutters. Coupe roof effectively cut away and replaced with fabric covered removable targa panels over driver and front seat passenger. Fabric-covered cross-over bar from side to side of the car, and behind it a fold-down fabric hood arrangement with Perspex rear screen. All cabriolets fitted with either Starfish or lattice alloy wheels. At the rear 'XJ-SC badging and either '3.6' or 'V12' dependent on model. Fuel filler moved to top of nearside rear wing utilising XJ Series chromed lockable cover. Side view easily identifiable by the frameless construction of the windows with no quarter-lights. Fitted fabric hood with small rear windows that electrically descend into the body when hood mechanism operated. No rear wing buttresses, and fuel filler cap positioned and of the same type as on cabriolet models. Rear screen of glass with impregnated heating element. Boot badges followed coupe practice. All convertibles followed later coupe practice with thinner multi-coloured swage coachlines. 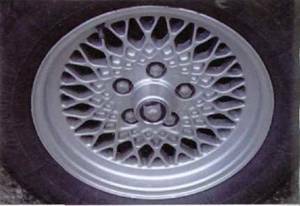 Lattice alloy wheels titled from 1983, standard on V12 convertibles and as an option on alt other models. All cars now featured the 3.6-litre style bonnet panel with raised centre section. Revised style of under-valance air intake. Blackened radiator grille but with chrome horizontal top finisher. Recognisable from the side by the frameless door windows without quarter-lights and enlarged glass area to rear side windows (coupes only). Substantial chromed rain gutters curved to match frame of rear side windows (coupe models). Revised rake to front screen with thinner chromed surround. Lattice alloy wheels initially fitted to all models. Other styles and options became available later. Square design indicator repeaters now fitted to rear bottom edge of front wings (replaced by badges for some export markets). New style flush chromed door pulls and locks. More angular appearance at the rear with buttresses retained for coupe model. Neutral density rear lighting units now incorporate enlarged reflector units stretching across boot lid to meet centrally mounted number plate. Chromed surround at rear now incorporates central section for boot lock and number plate illumination. 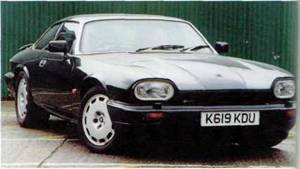 Stronger 'XJS' badging, also showing 'V12' badging where applicable to offside and 'Jaguar' to nearside. 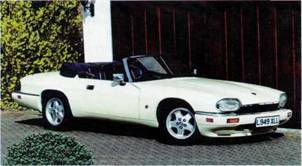 In all identification for post-facelift models, both written and badging, 'XJS' was used instead of 'XJ-S'. For a limited period in 1994 4.0-litre models gained colour-keyed brightwork around the headlights and door mirrors. Revised rear bumper bar treatment, which also included 'square' tailpipes. 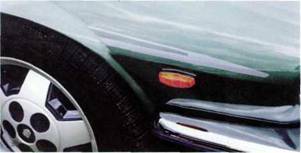 An ease of identification point was the adoption of all-enveloping reinforced plastic bumper bars at the front with chrome top finishers, and incorporating rectangular indicator lenses, number plate surround, under-bumper spoiler, and air intake and side reflectors at the front. Bumpers painted to body colour. For a period of about a year V12 models identified by chromed surrounds to headlights and wing mirrors, with 4.0-litres identified by these areas being colour-keyed. Later changed so that all models returned to chromed finish. At the rear same style of bumper bar treatment with integrated rear fog lights. Square or oval exhaust tailpipes according to model. Convertible rear screen altered to a smaller size to accommodate fold-down around 2+2 seating arrangement. Most cars fitted with new five-spoke alloy wheels but others available to order. From 1995 'Celebration' models featured Aerosport diamond turned alloy wheels, chromed surround to rear number plate, and restyled bonnet badge. NB: Variations in alloy wheel type occurred several times during production and were available as extra cost options anyway. Collection Rouge: Only available to the US market. Finished in Signal Red with matching diamond turned and painted lattice alloy wheels and gold coachline. US-style four headlight treatment and revised badging, with 'Collection Rouge' on boot lid and gold plated growler badge on bonnet. Classic Collection: Only available to the US market. Similar to Collection Rouge except limited range of exterior colours, new 'Classic' badging on boot lid, and rear spoiler fitted to most cars. Revised front badging as Rouge. Le Mans: Only available in European markets to commemorate Le Mans wins in 1988 and 1990. US four headlight treatment at front with gold growler badge on bonnet. Front spoiler painted to body colour. Twin gold coachlines along side of car and unique 'Le Mans' badging on boot panel. Lattice wheels and sports suspension fitted. Limited range of exterior paint finishes. 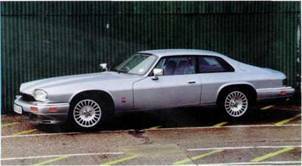 JaguarSport XJR-S models: Factory-build standard XJ-S shipped down to JaguarSport Bloxham works in Oxfordshire for final finishing, much of which was dependent on individual customer order. Replacement of front and rear bumpers by pre-formed plastic type painted to body colour. Front bumper incorporated indicator lighting as usual but also under-valance and air intake. Front radiator and light surrounds black powder coated. Door mirrors colour keyed to exterior paint finish, as was rear bumper which incorporated hazard lighting and under-valance with exhaust tailpipes. Brightwork again finished to either body colour or black powder coated. Speedline alloy wheels fitted with flush centre caps hiding wheel nuts. Wider wheels and tyres to suit. Over-sills to body sill areas painted to body colour. Boot lid spoiler curving down over both rear wings with hole drilled to accommodate radio aerial. Later post-1991 facelift cars adapted to same styling basis but with revised panels. Rear boot spoiler changed so as not to infringe on radio aerial. New alloy wheels with exposed wheel nuts. NB: Models produced by outside companies, including the initial TWR car, are not covered in this text. Last of the line 4.0-litre Celebration convertible with five-spoke alloy wheels (an alternative to the diamond-turned wheels available at this time). Last of the line top of the range V12 coupe with later 20-spoke alloy wheels, only fitted as standard on this model. Unique to the XJ-S were the TWR JaguarSport models built as a joint venture between Jaguar and the TWR Company, offering a more sporty appeal at a premium price. This early example with a modified 6.0-litre engine shows typical JaguarSport options like the bodykit and wheels and slightly lower set suspension. 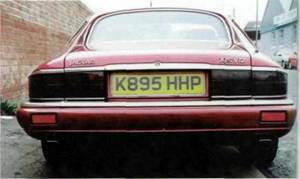 Rear-end treatment for JaguarSport models included bumper kit, four exhaust tailpipes, revised badging, and spoiler. Facelift style XJR-S by JaguarSport before production ceased at the end of 1992. Here the later style of body has been adapted to a similar specification to that of the earlier models, with new-style Sport wheels. 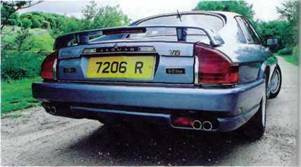 Later type spoiler treatment on the XJR-S model was also available for the standard cars.